Nothing can beat a road trip from Kashmir to Kanyakumari. India — A land of diversity, culture, and tradition; stretches from snow-clad mountains of Kashmir to the backwaters of Kerala. A land of colors, happiness, and taste. A land of dreams and hopes. Planning a road trip in India might get a bit overwhelming as there is so much to see and do. There are a plethora of activities and every city/state is unique when it comes to culture, food, and architecture. Our suggestion is to pick your destination wisely while planning your road trip in this beautiful country. The Journey: Start from Kashmir and end in Kanyakumari. Nestled in the foothills of the wonderful Himalayan mountains, the scenic splendor of Srinagar in the state of Jammu and Kashmir has attracted people since time immemorial. The city has mesmerized the Mughals, the Sikhs and the British over the course of the history. Enjoy a Shikara ride, stroll in the Mughal gardens or sample Kashmiri cuisines before you start your epic road trip in India. Ski at Gulmarg and enjoy a gondola ride. Visit Tajiwas Glacier in Sonmarg on your way to Kargil/ Leh. The road trip from Srinagar to Leh via Kargil is said to be one of the most thrilling and an experience of a lifetime. The heavy presence of the Indian Army can be felt as it is very close to the LOC (Line of Control). Roads in some places are bad and narrow, so make sure you are equipped well. It is advisable to stay overnight at Kargil/ Drass before heading to Leh. Enjoy the majestic Himalayan mountains. Experience zero gravity at Magnetic hills. Take in all the beauty and enjoy the silence. Drive from Leh to Manali via the stunning Spiti. The Spiti Valley is a desert mountain valley located high in the Himalayan mountains in the north-eastern part of the Indian state of Himachal Pradesh. The name “Spiti” means “The Middle Land”, i.e. the land between Tibet and India. The landscape in Spiti is amazing and not like anything that you will see anywhere else. Situated in the Beas River Valley, Manali is a hill station nestled in the mountains of the Indian state of Himachal Pradesh near the northern end of the Kullu Valley. It is located about 270 km (168 mi) north of the state capital, Shimla. Manali is famous for winter activities, hiking trails, waterfalls, snowcapped mountains, and glacier-fed streams. Bath at hot water spring at Manikaran Gurudwara, Kullu. Historically also known as Rāmdāspur and colloquially as Ambarsar. It is the spiritual center for the Sikh religion and the administrative headquarters of the Amritsar district in the state of Punjab. Explore the beautiful countryside of Punjab. Chandigarh is known as one of the best-planned city in India and is an ideal place to stop for a night before heading to the capital of India. Delhi boasts of lip-smacking street food, architecture, and history. Not just it is the capital of India but it was also the capital of different dynasties that ruled India over the centuries. It is steeped in history and the culinary scene is hard to give a miss. Explore the city monuments like Qutab Minar, Humayun’s Tomb, India Gate and much more. Do not miss the culinary scene. Agra is world famous for Taj Mahal but there is a lot more to see and do apart from the famed Taj Mahal. Jaipur- aka the famed pink city boasts of dramatic forts, beautiful temples, fairs, and festivals. The city will give you a beautiful introduction to the vibrant Rajasthan. If you are a non-vegetarian you are in for a treat. It is the largest city and the former capital of the Indian state of Gujarat. Ahmedabad is famous for architecture, woven fabrics and delicious food. Visit Calico Museum of Textiles. Nashik is known for its famous vineyards. Visit the famous Trimbakeshwar Temple. Mumbai conjures up images of tall skyscrapers, wide sprawling slums, throbbing nightlife, and monsoon. Mumbai (formerly known as Bombay) is referred to be a “City of Dreams“, people come from different places with starry eyes in the hope of making it big. The finance capital or you can say the commercial capital, fashion hub and of course, home to Bollywood — Mumbai is certainly the busiest and the populated city in India with almost 17 million inhabitants. Goa is the most popular tourist destination in India. Very popular among foreigners as well as the domestic crowd. Famous for its nightlife, beaches, food, quirky cafes, pubs and cheap alcohol. Indulge in various adventure activities like snorkeling, diving, paragliding to name a few. Gokarna is less crowded then Goa and is freaking beautiful. We highly recommend to stop and explore the secluded beaches of Gokarna. Located on the Deccan Plateau in the south-eastern part of Karnataka, Bangalore is India’s third most populous city. Also known as the “Garden City “. It is the IT Hub of India. There is not much to see or things to do in Bangalore but there are loads to places to see in and around Bangalore. If you have time at hand, you can include Lepakshi, Chunchi waterfall, Mysore, Shivnasamadura Waterfall, Coorg & Ooty to your itinerary. Wayanad is one of the exquisite hill stations of Kerala. Exotic spot with aesthetic locales. The vast expanse of tea estates and the fresh air welcomes you as you drive the winding roads of Munnar. The road trip is dotted with numerous waterfalls. It is easy to fall in love with this gorgeous hill station. Known as the “Venice of the east” — Allepey is a place where life moves in slow motion. Hop on a houseboat and enjoy the serenity of the beautiful backwater and enjoy your “ME” time. Soak in the beauty of the greenery all around. Kovalam is a beach town by the Arabian Sea in Thiruvananthapuram city, Kerala, India, located around 16 km from the city. Kovalam is an internationally renowned beach with three adjacent crescent beaches. Stay at an ayurvedic spa retreat. Nothing better than winding up your epic road trip at the southernmost tip of mainland India. Kanyakumari, formerly known as Cape Comorin, is famed for picture-perfect sunrises and sunsets. Enjoy the beautiful sunset at Vivekananda Memorial. A road trip in India gives you the best of everything and satisfies your hunger for adventure sports, water sports, cultural scene, trekking, beautiful landscape; from the snow clad Himalayas to secluded beaches of Kovalam, from tasting different cuisines to meeting different people speaking different languages. Before planning your trip to India, make sure you check whether you need to apply for a Tourist visa or not. If you need an Indian Visa, check the website for e-visa. You need to fill out an online application form. Once you fill in all the details and submit, you will get all the visa related instruction via email. As soon as the process is complete and payment is done, you will receive the visa within 24-72 hours. You can check the FAQ page for all your queries before applying. All the best for your trip. Hope you are able to complete the NH44 trip. Oh girl what an imagination! BTW are these photos clicked by you? Great list of road trips. Do like a few of them and I would attempt them in my next phase of India Road Trips. I liked it, this my dream trip too… but in my plan it is rount trip while coming back through th other side of india . Anyway it is wonderful…. I loved how you summed up the whole country on a single page and done it so well ..quick question though , is this a trip you were a part of or something you plan to do ? This is the Nice blog and Kashmir Trip at very cheap and affordable price. @ Wonderful! This is a nice blog. I like this and I am also trying to create blog. we plan a trip from Kerala to Hamachal and Kashmir on our Bolero camper by March 2015.Shall we get any workshops on the way in case if there is any mechanical complaints on the way…? What a trip! Now you must try an epic west to east trip! Cheers and happy traveling !!! This is a great read. We are planning to do this in 2016. What’s the best time to travel this road? Hi, I am deeply impressed. I am planning it on bicycle in coming March-2016. Thanks for sharing such great information. manali to leh route is very dangerous ,particularly after rohtang pass. there is no road at all. at places there are nullahs flowing water at zero temperature. no petrol pumps, no mechanic,no staying place, moreover at high altitude, people will vomit and suffer from various disease. motorbikes with heavy load , cannot run smoothly at high altitude. Thanks for sharing this, hope people will take note of this while planning the road trip. It’s not just Manali to Leh but there are many other places which need improvement. Wish you all the best for your trip. Starting From Pune Which Is My Hometown. 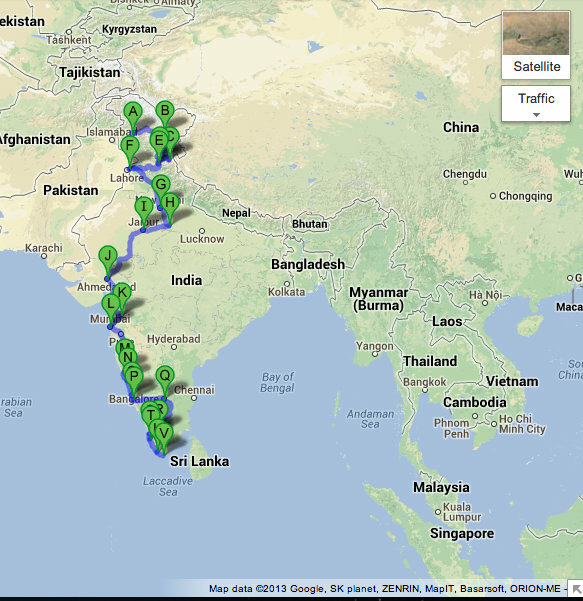 I’m Planning a trip from Chennai to Himalayas via Road, by Car. b)the Fuel cost ,assuming it would be a Petrol Car we would be on . c)Hotel stay and prices and the number of stops required. Since this would be the first adventurous trip that we’re excited to start on, require your Ideas and suggestions guys. hey…its amazing…i m also planing a trip from leh to mangalore next month on my motorcycle..i wanted to know about the safety while travellling with a girl…the issues you know, thieves, police, and other local issues on the way…how safe is it…how about if we get stuck somewhere..
hi …..was planning for a similar roadtrip by car….stumbled upon your blog.would highly appreciate your inputs in this regard regarding the time of travel ,breaks,car care etc.basically inputs regarding having all ends covered.this is my route map planned. Can you say an approximate budjet for this trip…??? can you guide us for route and other things ready with you. Nice , detail information. Thank you. I am planning all India tour for 365 days with purpose of spreading a message for students. Can you pls . provide few tips . Thank you so much. All the best for your trip. India is indeed incredible and this road trip definitely seems like an awesome idea! What time of the year should I visit to witness the evening parade at the Wagah Border? The ceremony at Wagah happens every evening throughout the year. I have seen this post last yr. Since then I m planning this trip. Just wanted to share that stage is all set this yr and I m leaving for this epic road trip adventure in June 2018. I will be covering all the destinations mentioned in this post. Can you please advise a bit on places to stay and approx distance of places from main city. I will be traveling on bike though starting from Jammu covering leh Manali and will be ending trip in Rameshwarm. Again thanks for sharing such a great information..
Stay depends on the budget so it’s really hard to suggest. I have done it in june.2018. thanks to you . i live in kanyakumari, the southernmost tip of india . how can i plan a road trip to all over india . I knew only english and tamil can i manage an road trip. which car or suv suites best for an long travel. Wow! its nice information share on this blog. I read your blog and i get the by road India trip information. I found this much useful information, as to what i exactly searching for India trip by road. Thanks a lot this beauty Enjoying article with me. I appreciate very much. road trip in india is the greatest feeling ever……thats why female bikers are enjoy their ride.. however, roads in north india is not upto mark..but south indian road are always great…. I was really inspired by your blog post and done the compelte K2K journey this ye in June. Itenary was same as shared by you in blog. Few places I missed but covered all others on my bike. It was around 10000 km solo bike ride. Thanks for being an inspiration.. Your article is very illuminating and has very beautiful and has detailed information about all the places you visited. I really enjoyed reading your blog. Very detailed info about the places to visit, the cuisines, the scenarios. Thank you for posting this article. I have read this blog and it is really very amazing. Thank you for sharing this blog. very beautiful article and very decriptive article.